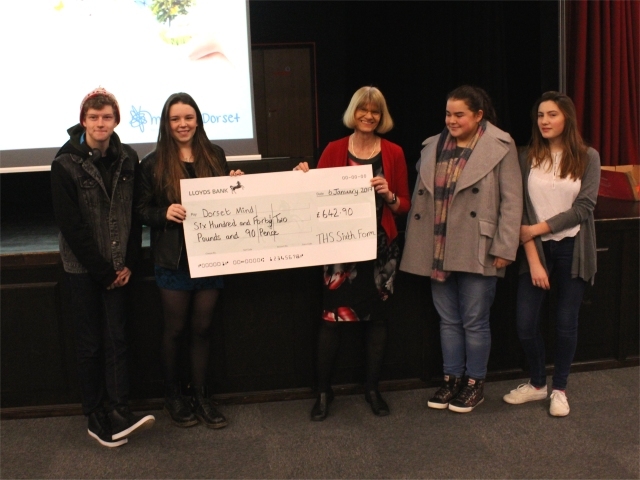 In June current Year 13 students, working within their tutor groups, were tasked with turning a £5 into a larger sum of money for a charity of their choice. The students came up with all sorts of innovative and entrepreneurial ways of “Growing their Fiver” with some groups organising Car Washes, Mario Cart Grand Prixs, Ice Lolly Sales, Raffles and Beat the Teacher penalty shoot outs. It was a great to see so many tutor groups working together, without too much teacher instruction, on a project of their choice. In the end 13 AD raised the most with £142.10p. This meant they scooped the prize of the cumulative total from all the other tutor groups. Their chosen charity, Dorset Mind, were presented with a cheque for £642.90p. A fantastic effort by the students. We were very grateful to CEO of Dorset Mind Chris Price who spoke to Year 13 on the 6th January about the work that Dorset Mind do in the community. She explained what is meant by the term emotional resilience. She was then presented with the Cheque by representatives of 13AD. Chris said that she would use the money to improve services and provision for young people in the area. It was an excellent assembly and great way to start Year 13s Wellbeing Tutor Programme for 2017 .